It’s a Summerlin favorite! 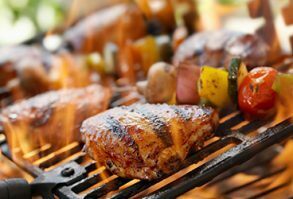 Enjoy the wide variety of selections from around the world, including wood-fired pizza, rotisserie chicken, hand-carved meats and more. 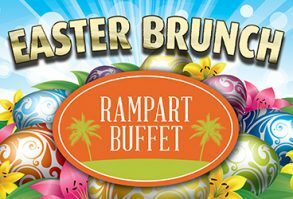 The Rampart Buffet is now featuring specialty nights Wednesdays, Thursdays, Fridays, and Saturdays. Try tuna poke, kalbi short rib, furikaki mahi with pineapple, or Alaea Hawaiian sea salt rubbed prime rib during Aloha Night on Wednesdays. Enjoy endless Dr. Brown’s sodas and Brooklyn-style favorites on Thursday New York Deli Nights. Dive into all-you-can-eat crab legs and seafood on Friday’s Seafood & Crab Legs Night featuring Prime Rib, only $26.99 with Resort Rewards Card. On Saturday’s Steak & Seafood Night you can enjoy Crab Legs, Marinated Mussels, and Shrimp Cocktail along with Beef Brisket and Rib at the carving station for $21.99 with a Resort Rewards Card. We’ve also added Champagne Weekend Brunch on Saturday and Sunday! Served from 9 am – 3 pm for just $12.99 with Resort Rewards card. *Children 3 and under are free. Children 4–7 are half price. Hours are subject to change. 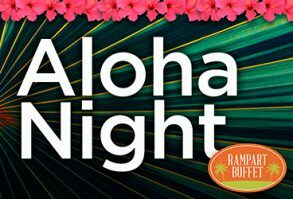 Enjoy Aloha Night at Rampart Buffet every Wednesday. 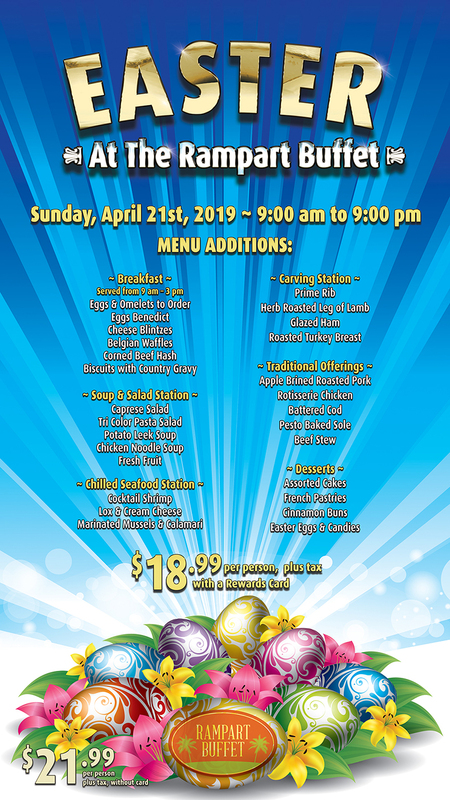 Featuring Hawaiian specialties such as chicken long rice, tuna poke, and assorted salads, kalbi short rib, furikaki mahi with pineapple, Alaea Hawaiian sea salt rubbed prime rib, spam fries, chicken curry, a carving station for char siu pork loin and a tropical-inspired dessert station with coconut haupia, tapioca pudding, lilikoi sponge cake and much more. 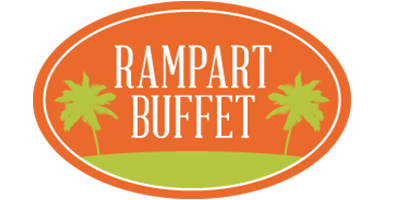 Earn and redeem buffets when playing with your Rampart Rewards card. 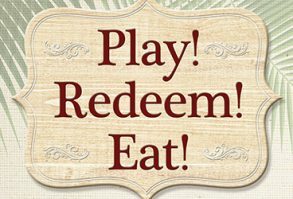 Monday through Sunday, earn 500 same day base points and redeem for a lunch buffet; earn 800 same day base points and redeem for a dinner or brunch buffet. Vouchers are valid for 7 days (maximum of 2 vouchers per day). 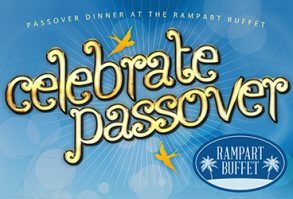 Visit the Rampart Rewards Club to receive vouchers. Wednesday: Aloha Night offers chicken long rice, tuna poke, and assorted salads, kalbi short rib, furikaki mahi with pineapple, Alaea Hawaiian sea salt rubbed prime rib, spam fries, chicken curry, a carving station for char siu pork loin and a tropical-inspired dessert station with coconut haupia, tapioca pudding, lilikoi sponge cake and much more. Thursday: NY Deli Night features fresh cut deli meats, knishes, latkes, knockwurst, egg creams, Dr. Brown soda and more. 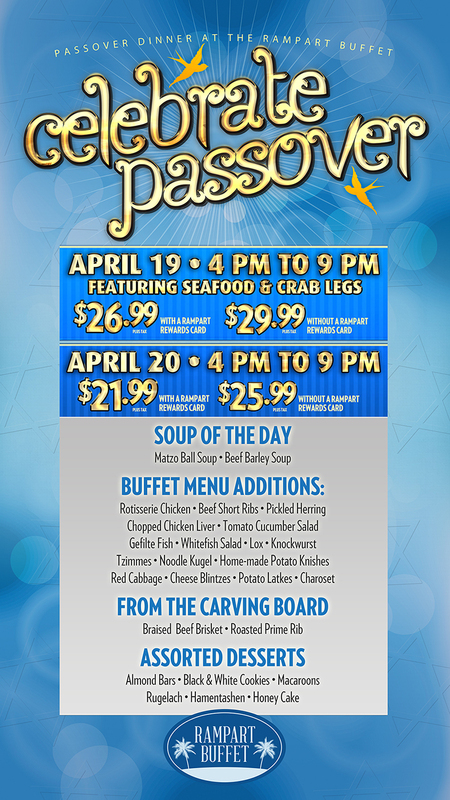 Friday: Seafood & Crab Legs Night offers guests delicious crab legs and slow-roasted prime rib, carved to order. Saturday: Steak & Seafood Night with crab legs features marinated mussels, shrimp cocktail, and beef brisket and rib at the carving station. Saturday and Sunday: Weekend Champagne Brunch offers smoked salmon, Asian dim sum, leg of lamb carving stations, omelets to order, unlimited champagne mimosas, & desserts prepared by our Executive Pastry Team.